We are happy to be back in business at SFCM with a new crop of very talented guitar students–freshmen, graduates and even some transfer students. And we welcome back the continuing students at all levels we already know and love. Our Wednesday sessions in the HGF alcove are going full speed ahead as we bring out of the display case each week guitars that tell the story of the evolution of our instrument. Many thanks to Pepe Romero Jr., our out-going Featured Luthier. His wonderful guitar will now join the SFCM collection, available on loan to students. It’s going to be a very popular guitar at SFCM. Last Summer I was approached by writer Jeff Kaliss for an article on HGF for Classical Guitar Magazine. Jeff came to SFCM to see the HGF display case and he interviewed me, David Tanenbaum and several SFCM guitar students. We look forward to seeing the article, the first serious media feature on the foundation. CGM was launched in England in 1982 by the well-known guitar scholar Maurice Summerfield. Last year the magazine was purchased by Stringletter Publications, the Marin County publisher of Accoustic Guitar, Strings and other publications. We welcome CGM to our Bay Area guitar community. We are delighted to have had the opportunity to be involved in this project as the non-profit sponsor. The premiere will be part of the bi-annual Biasini Competition and Festival being held this year at SFCM. Special thanks goes to Marc Teicholz who approached Ms. Assad and HGF to make this all happen. All indications are that this concerto will be an important new contribution to the repertoire. Funding for the commission came from a variety of sources, including New Music USA, HGF and SFCM. The OMNI foundation is also co-sponsoring the premiere as part of its new season of guitar concerts. 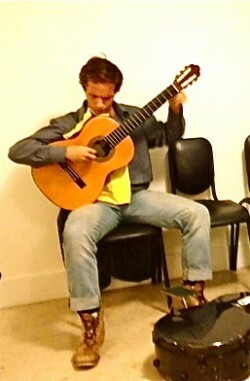 During the Biasini Competition (http://www.guitarcompetitionbiasini.org), HGF will present a group of important guitars from the collection—Torres, Bouchet, Garcia, Hauser, Simplicio, Rodriguez, Santos– with demonstrations by some of SFCM’s finest student players. L. John Harris and David Tanenbaum will co-host the showcase. The presentation will mirror the regular weekly gatherings at SFCM when students come to play and discuss guitars from the collection in the HGF alcove on the mezzanine lever of SFCM. The guitar Marc Teicholz has selected to perform the Assad concerto on is our 2008 Stephan Connor, built by the luthier in collaboration with Maestro Angel Romero. It has, incidentally, a 20th fret that is required to perform Ms. Assad’s composition. This is the guitar that launched SFCM’s close relationship with the Boston-area luthier. Maestro Romero began working with Steve Connor around 2005 on a guitar that would bare his name on the label. The instruments in this Angel Romero signature edition are made of the most exquisite materials available and are constructed to performance standards required and approved by the maestro. When Romero played this guitar at his OMNI foundation concert in 2008, I was able to try it along with members of the SFCM faculty. Impressed, I purchased the guitar and named it “el Rabino” (the Rabbi) because of its unusual six-pointed Star of David bracing pattern. David Tanenbaum and Rich Savino ordered Connor guitars almost immediately and others, including Marc Teicholz and the Assads followed suit. A new 2015 Connor guitar was just purchased by SFCM guitar alum Jeff Wells as a gift to SFCM’s guitar department in honor of the late Paul Binkley, a former instructor at SFCM. This guitar will go into our Featured Luthier cabinet during the Biasini Festival and Steve, who will be attending the Festival, will spend time with SFCM students discussing his techniques and philosophy of guitar building. From time to time, we come across an instrument that is both an excellent example of an important luthier’s output (both in condition and sound), but also helps us tell the story of the guitar’s development since it’s modern birth in the mid-19th century. Here are the four instruments recently added to the collection. You will be able to see pictures on our website latter this Fall. An ornately decorated guitar from Mirecourt, the center of guitar building in France from the late 17th to early 20th centuries. Restored to excellent playing condition by Richard Brune. A beautifully preserved guitar from the Cadiz region, a major influence on the revolutionary guitars of Antonio de Torres. The frets, action and a bowed neck were expertly adjusted recently by one of HGF’s Featured Luthiers, Alan Perlman. The father of the Granada school of guitar making, Ferrer made the first guitar owned by Segovia, from 1904 to 1913. 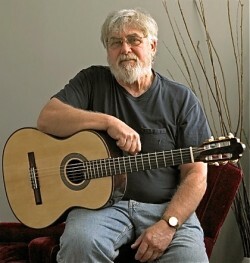 Alan Perlman replaced the worn frets and leveled the fingerboard. The only student of the great Marcelo Barbero, Arcangel Fernandez is highly regarded for both his flamenco and classical guitars. 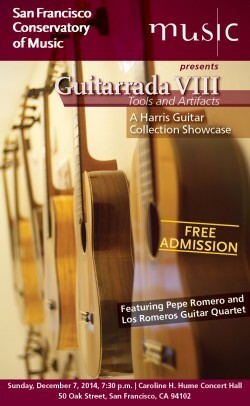 It has been reported that a Japanese guitar dealer bought the entire lifetime output of Fernandez’ shop in the 1960s, but some guitars, like the one in the Harris Collection, have been sold in Spain and made their way to the US. Its just in the planning and funding stages and the details are unclear, but we are starting to conceptualize an HGF project in which SFCM guitar students will participate with a local luthier in the building of a guitar that will become part of the SFCM’s student loaner collection. Details forthcoming in future blogs. What an amazing opportunity this will be for students to become familiar with the entire process of guitar building, documented in great detail. HGF will need to raise funds for the price of the guitar. Contributors to this HGF project at the $500 level or higher will be invited to join us for sessions at the luthier’s workshop at key moments during the guitar’s construction. The luthier will be generously donating his time to this project way beyond the labor of building the guitar. Guitarrada is coming! Hope to see you at SFCM on Sunday, December 7 at 7:30PM in the Caroline H. Hume Concert Hall. Tickets are free, no reservations required. 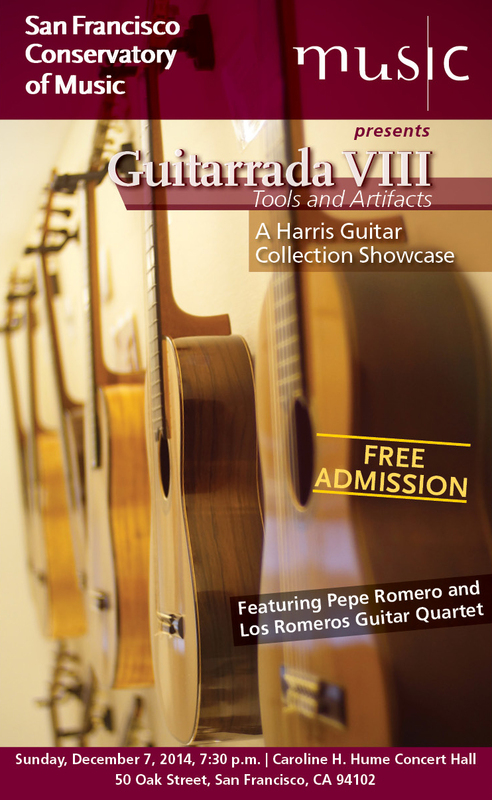 Guitarrada VIII—titled Tools And Artifacts— features the Romero guitar quartet–Celin, Pepe, Celino and Lito—and HGF’s new Featured Luthier, Pepe Romero Jr. Special guest performers include former SFCM guitar department chair, George Sakellariou, and faculty member Marc Teicholz. SFCM students will perform solo and in a quartet. The evening will offer typical Guitarrada fare– lively discussion about guitar history, guitar making and beautiful guitar music, including works by Piazzolla, Schubert and Torroba. Please note that the Romero quartet is in concert on December 6 at SF Jazz as part of the OMNI series with SF Performances (“Sold Out”). Many thanks to SF luthier, Alan Perlman, who was our first Featured Luthier in the new HGC display cabinet at SFCM, represented by a gorgeous Spruce and Satinwood guitar. His many meetings with guitar students this year were instructive and enjoyable. Our new Featured Luthier, San Diego’s Pepe Romero Jr., will be represented by a 2008 cedar and rosewood guitar, #138, which will be in the Featured Luthier cabinet at SFCM through the Winter. Pepe Jr. and his guitar will join us on stage at the Guitarrada to discuss the guitar, its sound and materials. His father will no doubt give the instrument an exciting test drive. On Monday, December 8, Pepe Jr. will meet with SFCM students to discuss his guitars and the influences on his work by luthiers represented in the collection. Much thanks to OMNI and SF Performances for their support of the Guitarrada. Los Romeros (from left to right) Lito, Celin, Celino, Pepe with HGF founder, L. John Harris, at the Romero home in Del Mar, 2014. Alan’s stint as HGF’s Featured Luthier has been a great success for all concerned—mostly for us because the students have met several times with Alan and absorbed a lot of his deep knowledge of guitars and how they work. His lovely satinwood guitar currently on display has been played and enjoyed by most of the students. I dare say that Alan has enjoyed the feedback from the students as well as his exposure to the collection. Teaming up with alum Kyle Sampson, Alan has been measuring the guitars in the collection and as soon as he and Kyle are done collecting the data, we will post it on the website. Thank you Alan for being our first Featured Luthier! This month we will be bidding farewell to the wonderful Alan Perlman guitar that has been featured in the showcase and replacing it with a very different animal–a cedar-topped guitar made by Pepe Romero Jr., #138 from 2008. Any one who has seen the PBS documentary on the Romero family (Los Romeros: The Royal Family of the Guitar) will recall the scene in which the son of Pepe Romero is making one of his first guitars. Fast forward 15 years. Pepe Jr. has become one of the best makers of his generation and his orientation honors not only Torres but also Santos, Rodriguez and Romanillos. Pepe will be with us on stage at Guitarrada VIII and I’m sure we will get to enjoy the sound of his #138. The recent sale at Brompton’s of a full-sized 1888 rosewood Torres brought a European record for the sale of a guitar–$178,000 with charges and VAT tax. Still, someone got a bargain. Torres guitars typically sell through dealers and collectors for between $200,000 and $300,000. In our next blog I will report on the comments of Brompton’s director, Peter Horner, and guitar scholar James Westbrook who oversaw the sale of the Torres. They will address the differences in assessing the condition of guitars versus violins and cellos and establishing values for auctions. We were delighted to have Randy Angella, the Bay Area guitar maker, join us recently for an HGF Wednesday gathering. Randy’s traditional Torres-style guitars are quite beautiful—in sound and appearance. His knowledge of guitar acoustics was a valuable contribution to our sampling and discussion of the collection’s two very different Antonio de Torres guitars. We hope to have Randy as a featured luthier in the future. Interested in helping HGF continue its growing involvement in the Bay Area’s musical life? It’s that time of year for tax-deductible contributions to charitable organizations you wish to support. Make your checks out to Harris Guitar Foundation and help us grow! Send to HGF, 1563 Solano Ave, Suite 201, Berkeley, Ca 94707. 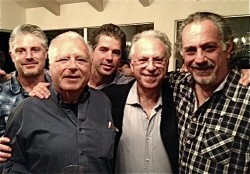 This second blog from the Harris Guitar Foundation is devoted to a very special concert at the San Francisco Conservatory of Music, celebrating the 50th anniversary of the guitar department at SFCM. Faculty, students and SFCM alums will perform guitar repertoire that spans the long history of the guitar, from the Renaissance, Baroque and Classical periods to the present. The guitar department at SFCM, led by David Tanenbaum, is perhaps the finest in the United States and the Harris Guitar Foundation is proud to support the curriculum by making the HGF collection of vintage guitars available to students, faculty and guests of SFCM. Two guitars from the Harris Guitar Collection will be featured in solo pieces performed by George Sakellariou, the first SFCM department chair, now retired, and Marc Teicholz, a current member of the faculty and a specialist in performing on historical instruments. If you intend to come, please get to SFCM early to get your seats–first come, first serve. I have no access to tickets so no need to contact me. But you can probably find me from 6PM-7:30PM in the alcove on the mezzanine level at SFCM, just outside the Caroline Hume concert hall. This is where the Harris Guitar Collection is on display in the spectacular 18 ft-long glass showcase. If you haven’t seen the display case, you really should stop by to see it and say hello. We got off to a great start last week with our regular Wednesday student gathering in the HGC alcove at SFCM. Several students got to play some of the oldest guitars in the collection, starting with the 1830 Rene Lacote. We played our way through Panormo, Arias and Torres. The great advance that Torres made from the 1850s onward was beautifully displayed with his 1888 maple guitar, SE 112, and the student players marveled at its tonal beauty, depth and balance. Two guitars from HGC will be played at the concert: George Sakellariou will be playing the collection’s newest addition, a 1915 Enrique Garcia. And Marc Teicholz will perform on the 1930 Santos Hernandez, the same guitar he recently recorded on for his CD featuring Sergio Assad’s arrangements of the Brazilian composer, Ernesto Nazareth’s piano music. Next week, luthier Alan Perlman, our current featured luthier, will meet with students to discuss his guitar making and its relationship to the historic guitars in the collection. In particular, he will be discussing the influence on his 2011 satinwood guitar from the collection’s 1929 satinwood Simplicio he repaired last year. Anyone wishing to try Perlman’s guitar while it is in the HGC cabinet can request an appointment with HGF. We announced our first major HGF project, Clarice Assad’s new composition based on a traditional Brazilian folk character, in our August blog and noted the funding completion thanks to New Music USA’s grant to Marc Teicholz, the project’s creator. But we had never heard any of the piece until last week—and OMG OSP! Clarice sent us a midi file of the piece and its clear she has created a work that will become a major concerto in the guitar repertoire—whimsical, rambunctious, haunting and percussive with a brilliant blend of melodic and dissonant elements that include orchestral singing and an array of offbeat sound effects. A real tour de force for guitar and orchestra. Congrats to Clarice and Marc. We can’t wait to hear the live premier performance, to be announced. A new HGF project led by Kyle Sampson and Alan Perlman. We are happy to announce a new HGF project. 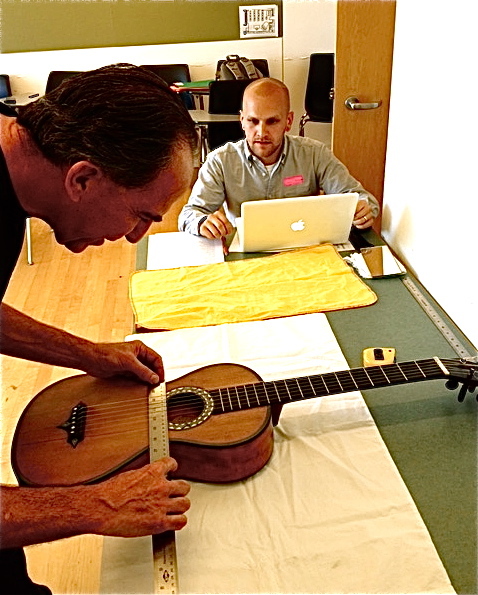 SFCM alum Kyle Samson has offered his time to work with luthier Alan Perlman to measure the guitars in the collection—dimensions of all the external and internal elements in a guitar’s construction. More than a mere technical exercise, this project will go a long way to explaining how guitar construction affects guitar sound (volume, tone, projection, etc). With his love of early repertoire and early guitars (Panormo, Lacote et. al. ), Kyle is acutely aware of the different sound qualities in the collection’s oldest and more contemporary guitars. Without applying simplistic “good/bad” judgments, Kyle respects the variations in the guitar’s tonal beauty displayed over the course of its evolution. Alan Perlman will bring his building and restoration mastery to the project. We will present their findings in future blogs and add dimensions to the collection’s guitar descriptions on the HGF website. Thank you Kyle and Alan! In our next blog, HGF will interview Brompton’s director and Dr. James Westbrook about the Torres guitar up for auction in October. I saw the guitar this summer and it’s a wonderful instrument in amazingly original condition. HGF would love to have the instrument in its collection (it’s a full-sized rosewood instrument) and someday HGF will have the kind of support and resources that could make this possible. At the moment, our fundraising needs for basic operating expenses takes precedence over our dreams for new guitars for the collection.